In series of tweets this evening, former Deputy Prime Minister Nick Clegg ruled out going to the House of Lords with the words “Ermine just isn’t my thing”. He lost the Sheffield Hallam constituency in last Thursday’s election. Nick Clegg was MP for Sheffield Hallam from 2005 to 2017 and was the Leader of the Liberal Democrats from 2007 to 2015. He didn’t rule out a return to The House of Commons but he did hint that he would he would make his voice heard as a journalist with a link to his article yesterday in the FT. The former leader of the LibDems Nick Clegg lost his seat last night. The ex-deputy Prime Minister was ousted from his Sheffield Hallam constituency by Labour. Jared O’Mara took the seat with 21,881 votes vs Clegg’s 19,756. ‘”I have always sought to stand by the liberal values I believe in but I have encountered this evening what many people have encountered before tonight and I suspect many people will encounter after tonight which is, in politics, you live by the sword and you die by the sword.” He said after his defeat. “We saw that in the Brexit referendum last year and we see it here again tonight, polarised between left and right, between different regions and nations and areas of the country, but most gravely of all, this huge gulf now between young and old. Of the three parties that have dominated politics in the UK for the last century, it is the Liberal Democrats that seen their support collapse in the run up to the current election. They believed that in joining a coalition they would see more sunlight and their credibility would rise. In truth it took just months for their share of support in the nation to fall from 23% at the election to less than 10%. Their support has bumped along at around 8% and no-one has been paying them much attention. With the new nationalist kids from UKIP and the SNP now on the block, they just haven’t been getting the airtime. Whether its desparation for attention or a genuine strategy the LibDems have been playing the election for laughs in the last few days. When Grant Shapps hit the spolight for allegedly tampering with Wikipedia the Lib Dems put out a press release from Paddy Ashdown saying “Grant is a wonderful guy – he is a credit to the Conservative Party …and if, like me, you have been lucky enough to meet him, you know you have been touched by greatness. Quite simply, a colossus.” Nick Clegg also suggested that it might have been Michael Green (an alias Shapps has used in the past) that was responsible for the edits. 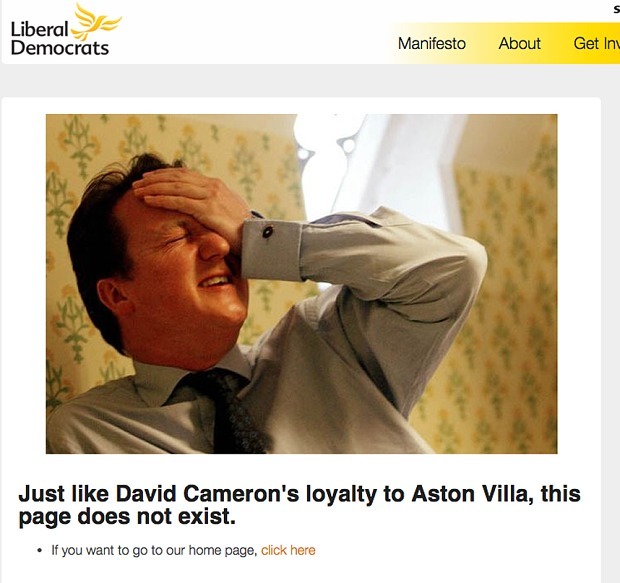 At the weekend when Cameron forgot which football team he supported the LibDems created an Error 404 page that said “Just like David Cameron’s loyalty to Aston Villa, this page does not exist. It’s a good gag, but maybe not enough to turn the tide. At the start of the week Lord Ashcroft published his latest batch of polls, this time from Scotland. Perhaps the biggest shocker was the 29 point deficit to the SNP faced by LibDem Danny Alexander, in his seat in Inverness, Nairn, Badenoch and Strathspey. Today it’s the LibDem leader’s turn. Lord Ashcroft announced today that it had come to light that the poll he had published for Sheffield Hallam included a mistake in the data. The corrected data means that rather than having a three-point lead Nick Clegg should have been three points behind Labour. The problem is that this poll was done in November, so whether the data was right or wrong, it’s completely out of date. Lord Ashcroft is an erstwhile activist so as I posted earlier in the week there are good reasons for treating his announcements with caution. On the 27 November the day that Ashcroft first announced TNS BMRB put the LibDems on 6% of the national vote, Today a YouGov poll puts them on 9%. 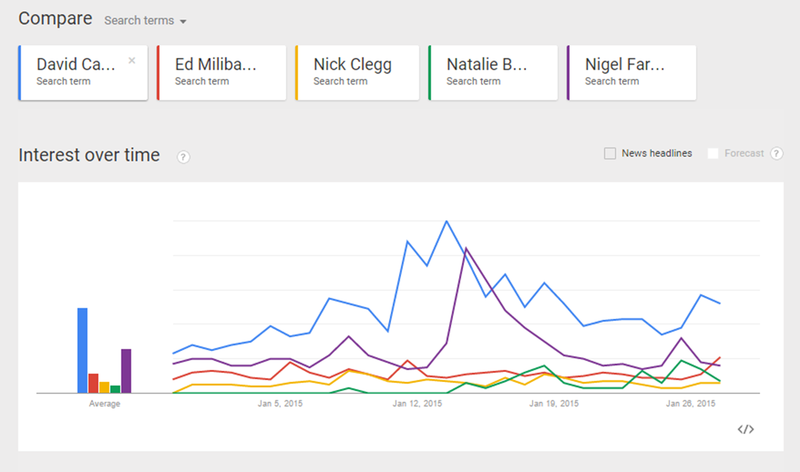 In search of a headline however The Telegraph, The Independent and Channel Four News all carry the line that Nick Clegg is on course to lose his seat. Perhaps he is, it looks as though he was, but a November poll is no basis for a February headline.